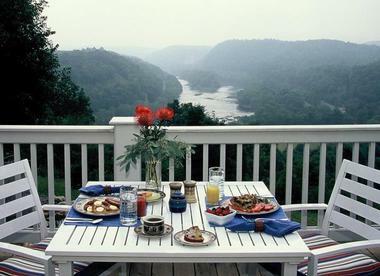 Virginia is home to beautiful romantic inns where guests enjoy fabulous views and great service. 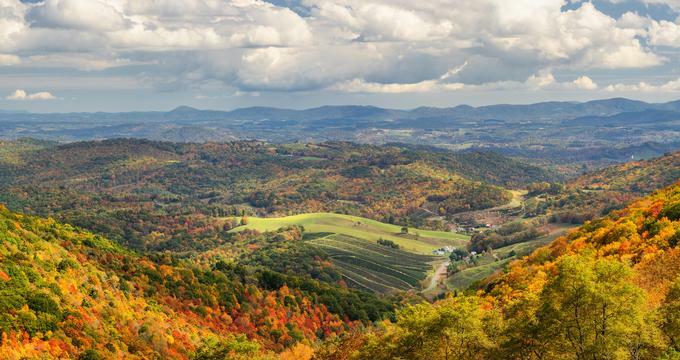 Shenandoah Valley, just short drive from Washington, D.C. is one of the top Virginia destinations that features over 200 vineyards and wineries. Other popular VA weekend destinations include Williamsburg, Virginia Beach, Roanoke, Richmond, Alexandria, Charlottesville, Norfolk and others. The Inn at Little Washington, a Relais & Châteaux, in Washington, VA is one of the best romantic getaways in VA, famous for its gourmet restaurant and attentive service. The 24 guest rooms and suites are professionally decorated with sumptuous touches that create an atmosphere of rest and relaxation. Choose from tastefully appointed rooms and 2-story suites, many with balconies and awe-inspiring garden views. Guests can stroll through the manicured grounds or simply unwind in a comfortable chair with a good book. The Inn’s restaurant serves an innovative menu that features incredible courses designed by award-winning chef and proprietor Patrick O’Connell. The 14,000 bottle wine cellar offers endless choices to accompany mouthwatering meals. Guests can go on daytrips to nearby farms to pick fruit, tour a winery, play golf and go antiquing. Luray Caverns offer exploration and adventure, while Shenandoah National Park is a playground for outdoor enthusiasts. Rooms start at $363 per night. 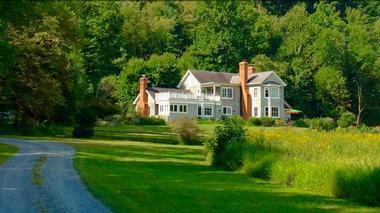 The property is 1 hour and 30 minutes from Washington D.C. and 2 hours from Richmond. Guests can play tennis, croquet, and hike on the marked trails. The infinity swimming pool and hot tub are ideal for unwinding, while the lake dock is the perfect spot for fishing. The award-winning wine cellar provides pairings for the menu items prepared by Clifton’s Restaurant. Breakfast is served on the sun-filled verandah. Head to Charlottesville to explore regional history and culture. Dining and entertainment options abound, along with prestigious wineries and craft breweries open for tours. Goodstone Inn & Restaurant is a luxury weekend getaway in Virginia's Wine Country, offering a choice of accommodations in several distinct buildings, and 265 acres of natural surroundings. If you are looking for a weekend idea from Washington D.C., visit this charming inn to relax and rejuvenate in the country. You will be right in the heart of the Wine Country where you can taste the region's best wines and go on romantic weekend walks in the countryside. Choose from 18 elegant guest rooms and luxury suites in Manor House, Spring House, Carriage House, Dutch Cottage and French Farm Cottage. You can book an entire residence for complete privacy. Residences have cozy sitting rooms with fireplaces, outdoor patios, and hammocks. 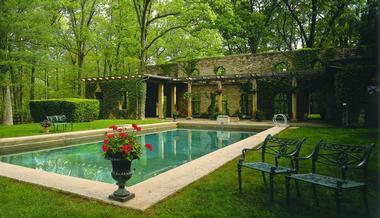 During the warmer season, the estate offers biking, hiking, canoeing, and an outdoor pool. If you are looking for luxury and elegance, Goodstone Inn & Restaurant is one of the best vacation spots in Virginia. 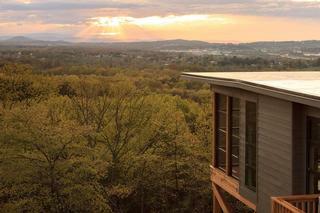 Iris Inn enjoys spectacular views of the Shenandoah Valley from its mountaintop location in the Blue Ridge Mountains. The property offers several great accommodation options: luxury rooms in the main building, romantic cabins and cottages. When you check into one of the cabins on your weekend trip, you feel like a bird nesting above the surrounding trees and the valley. Each cabin has a full size kitchen, laundry facilities, heated floors and a two-person shower. There is a hot tub on the terrace overlooking the valley. Cabin rates start at $239 per night, rooms from $149. More nearby vacation ideas: 20 Beautiful Romantic Weekend Getaways in West Virginia. Briar Patch Bed & Breakfast Inn near Middleburg, Virginia, is a historic farm set on 47 scenic acres overlooking the Blue Ridge Mountains. The getaway offers romantic rooms in the main house as well as a one-bedroom cottage with a fully equipped kitchen. Guests receive complimentary wireless Internet access, free snacks and plush robes. Several times a year, the property offers cooking classes which teach you how to prepare 5-course gourmet meals paired with local wines. Nearby activities include horseback riding, tennis, golf, biking and wine tours. Rooms start at $95 per night. The cottage starts from $245. The Inn at Riverbend in Southwest Virginia is a romantic getaway with spectacular views of the New River which meanders through the Appalachian Mountains. Ask for a room with a view of the valley to enjoy the best views and listen to the sound of the waterfalls while you sleep. New River Valley in Pearisburg, Virginia is an outdoor lover's paradise. You will be surrounded by scenic hiking trails, fly fishing and kayaking. The view from the property is so incredible that you may decide to spend your entire weekend relaxing on the outdoor deck. Plan a 2-day trip so that you will have plenty of time to go on excursions in the area. Rooms start at $190 per night. The Williamsburg Inn is a romantic getaway in Colonial Williamsburg, Virginia, offering 19th century Regency decor and five star service. A great choice for couples touring the historic sights, a stay at the inn is by itself an way to immerse yourself in America's rich cultural heritage. Attend one of the numerous events in the area, visit replicas of historic taverns and shops, and dine at one of the unique restaurants. The inn often offers romantic dinner and other events during the holidays. Guest rooms measure at least 500 square feet in size, and have marble bathrooms, English Regency-style furnishings, and comfortable seating areas. All rooms and suites have recently been renovated. Ask for a room or suite with a fireplace, especially if planning a romantic getaway. A Junior Suite has a king bed and an adjoining parlor with a queen sleeper sofa. This suite measures 600 square feet in size and has two 26-inch flat-screen televisions, giving you plenty of room to relax and rejuvenate on vacation. The resort spa offers naturally-lit treatment rooms, Rose Suite for couples massages, and an array of services. Have afternoon tea at the Terrace Room, and taste gourmet cuisine at the renowned Regency Room. Room start at $399 per night. Find more quick getaways. The Stonewall Jackson Inn is a historic getaway located in Shenandoah Valley's wine country. 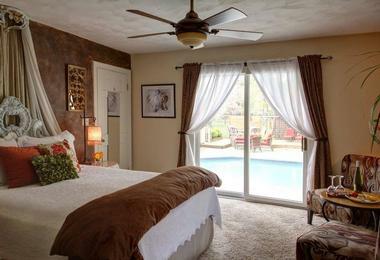 Guests are accommodated in romantic rooms with New England cottage-style interiors. The Stonewall Jackson Suite is the most spacious, featuring a large bay window, sitting area and wet bar. Downtown Harrisonburg offers a choice of cafes, restaurants and shops. If you are wondering what to do this weekend, this is a destination with many leisure activities. Room rates at the Stonewall Jackson Inn in Harrisonburg, Virginia, start at $149 per night. 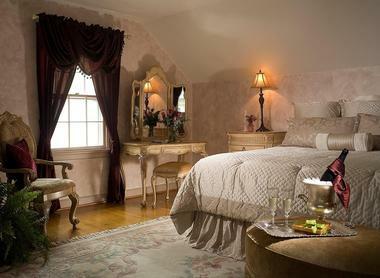 The Mimslyn Inn in Luray, VA is a seamless blend of history-infused tradition and romantic contemporary comfort. With picturesque natural surroundings, the 45 guest rooms have each been individually decorated, complete with private bathrooms, lush bedding and Wi-Fi. The property offers expansive lawns, beautiful gardens, landscaped terraces, and oversized patios. The onsite spa, swimming pool, hot tub offer plenty of relaxation. Circa ’31 features a menu that includes traditional comfort foods and fresh innovative dishes containing local and seasonal ingredients. The Speakeasy Bar and Restaurant offers a full bar and comfort food such as chicken pie, soups, and more. Visit downtown Luray for shopping and additional dining options. More Virginia Virginia vacation spots: Best Things to Do in Virginia Beach. Located in Charlottesville, Virginia, the Foxfield Inn is a luxurious bed and breakfast that offers a tranquil escape. Five beautifully appointed guestrooms serve as serene retreats with gas fireplaces, luxurious Jacuzzi tubs and lovely views of the garden. Deluxe linens, comforters, plush robes and slippers add a special touch, and rooms include state-of-the-art Bose sound systems to which iPods can be attached. The inn has complimentary Wi-Fi throughout and a television and DVD player in the cozy den offering evening entertainment. A gourmet three-course breakfast is served each morning with freshly brewed coffee in the sunny breakfast room. Guests receive afternoon refreshments, such as cookies, fruit, and beverages in the lounge. The inn’s ideal location in the heart of picturesque Charlottesville makes it easy to explore the surrounding attractions, wineries, historic homes, and a diverse choice of outdoor activities. Rooms start at $190 per night. L’Auberge Provençale is a country inn surrounded by the beautiful Shenandoah Valley near White Post, Virginia. All of the inn’s rooms are decorated in the Provençale style with bright colors, comfortable furniture, private baths, and luxury linens. Breakfast is served each morning in the bright, cheerful sun room. The inn offers amenities such as free Wi-Fi, aromatherapy showers, and free afternoon snacks and drinks. Also on site is the award-winning restaurant, “La Table Provençale.” The restaurant features gourmet meals made from fresh, local ingredients, some of which are grown right at the inn. The restaurant also has an extensive list of wines, spirits, and original cocktails. Step back in time at the Mayhurst Inn. This Victorian plantation home was built in 1859 and contains much of the original architecture and antique furnishings. Each of the inn’s eight rooms have private baths and fireplaces. A full three-course southern breakfast is served each morning, and wine, cheese, and snacks are served each evening. In addition, the inn offers many packages such as romance, Civil war, golf, and adventure to help you get the most out of your trip to historic Virginia. The Mayhurst Inn was visited by Civil War generals Robert E. Lee and Stonewall Jackson. Six Civil War battlefields and 2 museums are located nearby. The Country Villa Inn is a casually elegant bed and breakfast located just minutes from Virginia Beach. The inn is decorated in a classic European country style, but includes modern amenities such as down pillows, luxury linens, jetted tubs, spa-quality toiletries, a large television with DVD player and video library, an iPod docking station, and an in-room refrigerator stocked with complimentary sodas and water. Accommodations include a three-course breakfast, complimentary bottle of wine and cookies upon arrival, and wireless internet. Guests can relax by the pool or indulge in an in-room massage. Nearby attractions include the beach, restaurants, shopping, museums, and fishing and watersports. 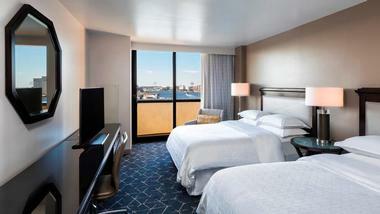 The only Norfolk waterfront hotel, Sheraton is an modern upscale hotel a short walk from downtown Norfolk and less than a mile from Nauticus. The sleek, contemporary rooms and suites have streamlined décor in soft, relaxing colors as well as flat-screen TVs, free Wi-Fi, desks with ergonomic chairs, and sofas. Many rooms have wonderful views of the waterfront and the harbor and some have balconies. Club rooms have the use of a lounge, where they can have complimentary breakfast, snacks all day, and small appetizers in the afternoon. Suites add a wet bar and sitting areas. Hotel guests enjoy an outdoor pool, a gym, and a large, modern business center. The hotel’s gourmet restaurant overlooks the harbor and offers gourmet seafood dishes, and there is also a cozy bar and a landscaped patio. 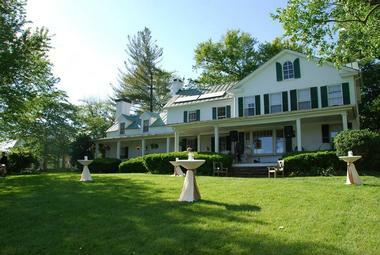 The Middleton Inn Bed and Breakfast is a classic country estate located in Washington, Virginia. This critically acclaimed inn features amazing views of the rolling hills of the Virginia Countryside. Guests are treated to comfortable accommodations, complimentary port and chocolate, baked goods, and a three-course breakfast each morning. There is no shortage of things to do in the surrounding area, including shopping, gourmet dining, golfing, horseback riding, hiking, and antiquing. Guests can even watch horseback racing and experience foxhunting in the spring and fall! The inn is pet-friendly, so you don’t have to leave your four-legged companion behind. Housed in a colonial brick building, the Richard Johnston Inn is an award-winning hotel located in downtown Fredericksburg, Virginia. The Inn has been named “The Best of Washington for Weekend Getaways” and “Best in the Burg” by local travel publications. The property, and its sister property, the Caroline House, contain comfortable suites with luxury linens, antique furnishings, private baths, and free Wi-Fi. A full breakfast is served each morning. Restaurants, shops, and historic sites are within walking distance of the inn. The inn is pet-friendly and offers special romance and wedding packages. 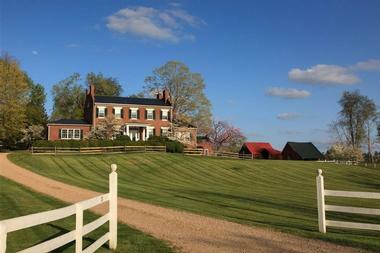 Classic Victorian elegance in the Virginia Countryside. The Ashby Inn is a 10-room guest house located one hour west of Washington, D.C., in the heart of Virginia’s wine country. Each room is individually decorated with 19th century antiques. In addition, the inn boasts beautifully landscaped lawns, an organic garden, and beautiful views of the Blue Ridge Mountains. The restaurant at The Ashby Inn is world-class, offering sophisticated entrees using fresh, local ingredients. The inn also offers over 250 wines from the nearby Virginia winemakers and from vineyards around the world. They pride themselves on pairing the right wine with your entrée for an unforgettable meal. Colonial Gardens Bed & Breakfast is an elegant bed and breakfast with beautifully landscaped grounds located in Williamsburg, Virginia. This inn knows how to pamper its guests. Each room includes luxury linens and spa towels, plush bath robes and high-end toiletries, Wi-Fi, and a refrigerator with complimentary snacks and sodas. A gourmet breakfast is served each morning, and concierge service is available to help guests plan their special outing through historic Williamsburg. The bed and breakfast is located near shopping, restaurants, and attractions such as Colonial Williamsburg, Busch Gardens Williamsburg, the Shirley Plantation, the Yorktown Battlefield, and the Jamestown Settlement. 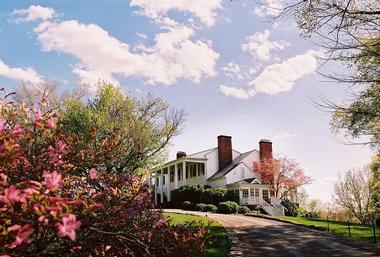 Located in Irvington, Virginia, the Hope and Glory Inn offers guests a truly unique bed and breakfast experience. Guests can choose to stay in one of seven guest rooms located in a converted schoolhouse or in one of six private cottages surrounded by lush garden greenery. There are also “tents,” which are actually quaint cottages in a campground like setting in the vineyard. All accommodations include breakfast. The property also includes a dining hall, bar, spa, salt-water pool, and an outdoor garden bath and shower. Guests can also tour the on-site vineyard, take a boat cruise on Chesapeake Bay, or play golf at one of several nearby courses. The Inn at Sugar Hollow Farm is a secluded, romantic country getaway nestled in the foothills of the Blue Ridge Mountains. There is no shortage of things to do in the nearby area. Hiking, craft breweries, wineries, antiques, art, and history are all just minutes away. After a busy day of exploring the Virginia countryside, guests can return to their room at either the main inn or the converted 1905 farmhouse on the property. All rooms have simple, colorful country furnishings and include fresh flowers and complimentary gourmet chocolates. A buffet-style country breakfast is served each morning. The word “arcady” means “an ideal rustic paradise,” and that is exactly what travelers will find at Arcady Vineyard Bed and Breakfast. 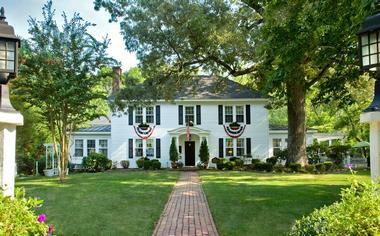 The inn is a comfortable country retreat located outside of Charlottesville, Virginia. The property includes a working vineyard, so wine is always on the menu at Arcady. Bookings include a full breakfast and complimentary wine, sodas, and snacks each day. Guests can tour the vineyard, stroll through the forest paths, or watch wildlife from the back porch. Nearby attractions include several Virginia wineries, the Charlottesville Downtown Mall, and Monticello, the home of Thomas Jefferson. A Williamsburg White House is a historic, century-old estate that has been converted to a bed and breakfast with a presidential theme. The rooms are individually decorated and all contain feather beds, private baths, and free wireless internet. Breakfast is served each morning in the stately Reagan dining room, and complimentary wine and snacks are available during the day. 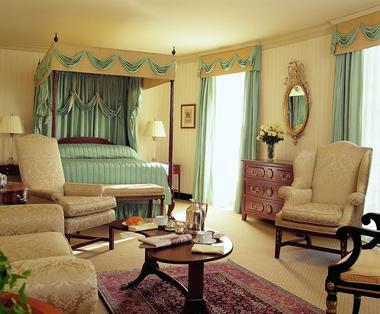 The inn also includes a JFK library, a diplomatic reception room, and gardens dedicated to Winston Churchill. 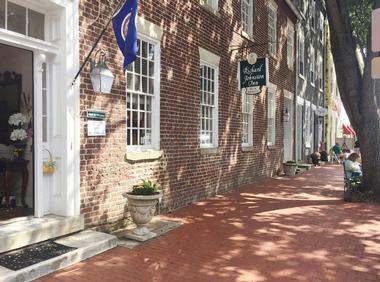 The inn is located in the heart of historic Williamsburg. Travelers can see preserved historical homes and buildings or watch a re-enactment of life in a colonial town. Brierley Hill Bed and Breakfast is a comfortable country retreat nestled in the heart of the Shenandoah Valley. Each of the inn’s cozy rooms includes a private bath, fireplace, and sitting area. A home-cooked breakfast featuring fresh local seasonal ingredients, some grown right at the inn, is included with each booking. The hiker friendly inn offers breathtaking views of the Blue Ridge Mountains. Nearby attractions include shopping, restaurants, and historical sites such as the Stonewall Jackson House and the Lee Chapel and Museum. Guests can get outdoors and hike along the Appalachian Trail, or experience fly fishing or horseback riding. 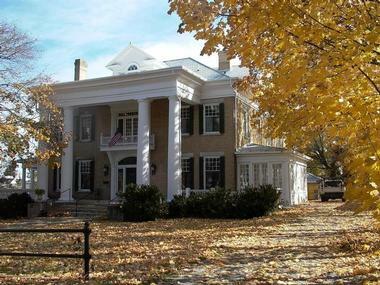 Experience early American history while enjoying the beautiful Shenandoah Valley at the Frederick House. The inn is located in historic Staunton, Virginia. Shopping, world-class dining, coffee shops, music venues, The American Shakespeare Center’s Blackfriar Playerhouse, and the Woodrow Wilson Presidential Library are all within walking distance of the inn. 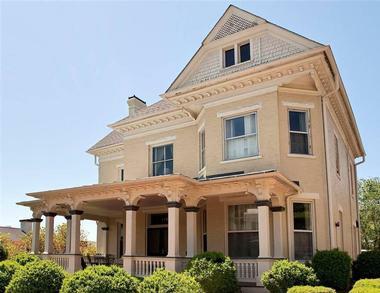 The Frederick House is a 23-room bed and breakfast that offers guests outstanding amenities, privacy, and service of a luxury hotel. Guests will enjoy a hot breakfast each morning before heading out to see the natural beauty of the Virginia countryside or the many nearby historical sites. The Trinkle Mansion Bed & Breakfast is conveniently located near two interstates between Charleston and Charlotte, and is the perfect stopping point for travelers to Virginia, Georgia, and Florida. The inn is housed in a classic Southern mansion and decorated in the antebellum style. There are four guest rooms and a private garden cottage from which to choose. Three-course breakfasts, drinks and snacks, luxury linens, toiletries, robes, and slippers are included with each booking. Hiking, golf, wineries, shopping, restaurants, and antiquing are all located nearby. Guests can take a scenic drive along the Blue Ridge Parkway, or tour some of the nearby historical sites. Virginia is a great place to visit for history buffs, wine enthusiasts and beach lovers. Take a day trip and hike in the mountains or go on a wine tasting tour. Look for vacation packages that include romantic perks such as wine on arrival, flowers and chocolate. If you are still wondering what to do, your hotel can recommend scenic drives, tours, treks, one day trips and other activities near your point of departure. Virginia's Eastern Shore is home to Chesapeake Bay, barrier islands and wetlands, great for relaxing on the beach with a view and exploring wildlife habitats. Activities couples enjoy together include sailing, kayaking, canoeing, biking and romantic sunset cruises. Guests of all ages enjoy hands-on learning about America’s history at Colonial Williamsburg where you will find restored 18th century houses, historic activities as well as shopping. There are many inns and bed & breakfasts to choose from in the area, making it easy to plan a quick romantic trip. In this area, you will find Thomas Jefferson's home, the University of Virginia and the city of Charlottesville at the foothills of the Blue Ridge Mountains. Visit Shenandoah National Park where you can enjoy scenic hikes, mountain biking and fresh mountain air. Northern Virginia is home to Mount Vernon, Gunston Hall Plantation and Manassas National Battlefield Park. Combine a vacation to these historic sites with a quick trip to the nearby Washington D.C.
Richmond, Fredericksburg and the Northern Neck offers couples a variety of things to see and do, from the Museum of Fine Arts to the birthplaces of several U.S. presidents. The Virginia Wine Trail features over 160 wineries, great for wine tasting vacations.